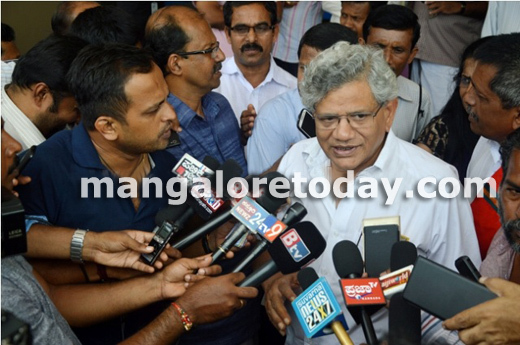 Mangaluru: September 3, 2015: Communist party of India (CPIM) leader Sitaram Yechuri visited Sundar Malekudiya at AJ hosital on Thursday and exchanged pleasantries. Sitaram Yechury was accompanied by local CPIM members. Speaking to Media personals, Yechuri expressed disappointment about the incident and demanded the police to take stringent action against the accused. In addition to that he said, such incidents destroy peace and harmony in the society. He censured that government is taking no action against the assault on Dalits. It may be recalled that Sundar Malekudiya, a resident of Belthangady taluk was brutally assaulted by his landlord named Sundar Gowda on July 26. 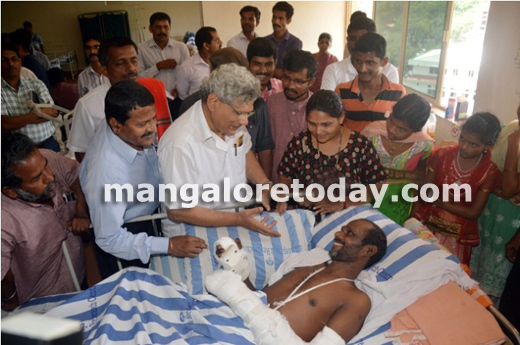 Sundar Gowda had chopped off his hand and four fingers of another hand using tree cutter.